The acting Provincial Administrator of Southern Highlands, will be conducting an audit into qualifications of public servants employed by the provincial government. Thomas Eluh, says this is to determine if people occupying positions are qualified and deserve the positions they hold. Mr Eluh says those who occupy positions without proper qualifications will be asked to leave, and those positions will be publicly advertised. He says the province has suffered for so long because public servants in the province have not been performing, and collecting they pays either from Mendi or outside the province. Mr Eluh says he will be operating out of the seven-storey Agiru Centre building this year, and it will be opened for all government business operations. Meantime, banking officials in Mendi and Port Moresby, have been informed not to entertain any payments from government officials inside and outside of the Southern Highlands Province. Thomas Eluh said banks should not entertain people running around with government cheques from the province, because some of them are illegally using them. 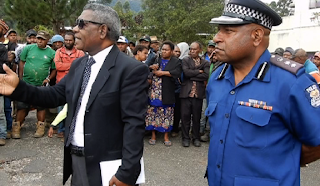 He said people fronting up at the banks with cheques from the Southern Highlands Provincial Administration, could face possible prosecution by fraud officers. Mr Eluh said it has been a norm for the province where payments have been made to people who have done nothing, but this will now stop under his administration.